Last night I sat on a panel for an event with the NY chapter of the Alliance for Women in Media. My former boss moderated and there were a number of super impressive women on the panel. The topic: taking risks in your career. I often ask people to take risks in their job searches — to send a cold email, to attend that networking event, or to negotiate an offer — but last night’s topic was even more important than that. Once you land in a job, the risks don’t stop. To get ahead, you need to take risks not only on a daily basis, but in the big career-changing moments that appear. 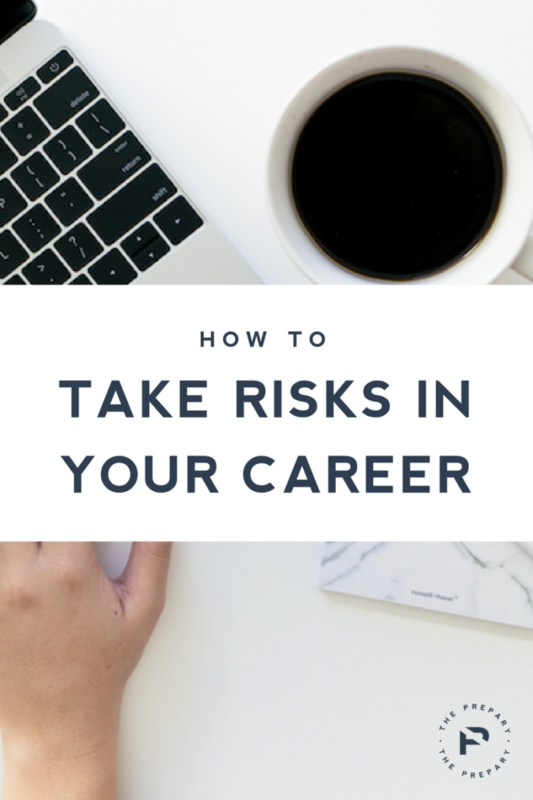 Based on the advice shared and a great audience discussion, here are 5 things you need to know (and do) to take risks in your career and get ahead. One thing that a few panelists agreed upon (and I do too) is the unfortunate fact that growth and advancement are NOT comfortable. If you’re feeling like you’ve got it all under control, you’re probably not in your biggest moments of growth. So that’s the first thing… if you’re not challenged and a little freaked out, you’re probably not moving forward as much as you could be. Another big theme last night was about proactively raising your hand for big opportunities. Yes, there are times in your career when a great one is going to present itself but you can’t wait around for that. Ask to present at a big meeting, raise your hand for that job that just opened, ask for more money, offer to do something you haven’t done before. Basically, get proactive about putting yourself in those uncomfortable situations to get ahead. Oh man, this one resonates with me. The number of times I’ve felt out of my league in terms of an opportunity presented to me is almost embarrassing. Even though I know about imposter syndrome (and have literally shared a video on it on this site) and know that women doubt themselves way more than men, I still suffer from this. What Tina said and what I’ll tell you is, yes, you ARE qualified. Being qualified to do something doesn’t mean you’ve already done it 100 times and perfected it. It means you have the ability to take it on and figure it out. I have been fortunate to have some amazing mentors in my career. Some of them were people I reported to and others are peer mentors. Even supportive friends and family members can be mentors. The only criteria are that they know what you are capable of and they support you. I was able to start this business while still working in my job at Tory Burch because of their support. I have been able to negotiate more for myself because of their support. And most importantly, many of my mentors have worked with me and they know what I’m capable of. So when I have a moment of self-doubt, I can call them and they can re-assure me that I’m not walking into something I can’t handle (and by the way, I think they would tell me if I ever were). Risk-taking isn’t just about saying yes to things that come your way. One panelist pointed out (and I SO agree) that it’s just as important to say no. People are constantly going to ask for your time and attention, but if you’re always worrying about what they need then you’re not focusing enough time on what’s good for you. Saying yes to something inevitably means taking something else (that may be important to you) off your plate. Consider your time and energy precious. It truly is.